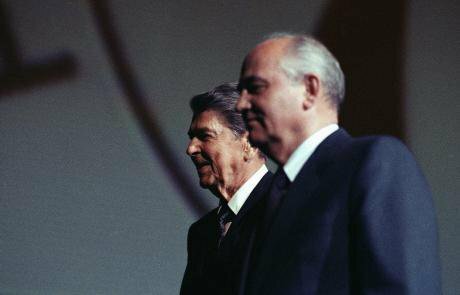 Both Gorbachev and Reagan were involved in creating "dialogue" between the Soviet Union and the US during the late 1980s. (c) Mark Lennihan / AP / Press Association Images. All rights reserved.Against the background of worsening relations between Moscow and Washington over Russia’s war on Ukraine and its military support for Assad’s regime in Syria, recent reports from Russia give the impression that the country is preparing for a war with the west. These reports have led some experts and political commentators to claim that Russia and the west are now engaged in a new cold war. The latter concept is not new. In 2003, for example, Michael Klare argued that the world was witnessing the beginning of a new cold war in south-central Eurasia between the US on the one hand and Russia and China on the other. The sheer amount of references to this concept today, as well as mentions of Russian nuclear capabilities, reflects a growing trend to interpret Russia’s actions in the Cold War frame. Indirectly, Russia threatened the US with nuclear weapons already in March 2014, right after the illegitimate referendum in Russia-occupied Crimea. At that time, Dmitry Kiselyov, head of the Russian Federal State News Agency “Rossiya Segodnya” (“Russia Today”, not to be confused with the RT TV channel), mentioned during one of his shows that Russia was the only country in the world capable of turning the US into radioactive dust. Kiselyov was sanctioned by the EU and Canada a few days after this statement. At the time, Kiselyov’s statement appeared a one-off act of impudence, but the most recent developments suggest a more worrying picture. At the end of September this year, representatives of Russia’s Ministry of Emergency Situations reported that they had checked all the bomb shelters in Moscow and confirmed that they could provide cover for the entire population of Moscow. At the beginning of October, Russia’s president Vladimir Putin suspended a treaty with the US on cleaning up weapons-grade plutonium. Then large-scale civil defence exercises took place involving 40m people across Russia and all the units of the Ministry of Emergency Situations including its air force. Around the same time, a host of an ordinary Russian TV weather forecast show suddenly announced that an explosion of a nuclear warhead over the Nebraska state would knock out all electronic devices in the US, southern Canada and northern Mexico. Then a representative of the Russian Ministry of Defence implicitly threatened to shoot down US jets in Syria were they to attack Assad’s military forces. And just a few days ago, Russian authorities expressed their intention to build Russian military bases on Cuba and in Vietnam. 6 October, 2016: A Russian weather forecaster talks of exploding a nuclear bomb above the US state of Nebraska. The Cold War period was characterised by similar developments from the Soviet side. The Soviet Union stationed military facilities, in particular, on Cuba, in Vietnam and Syria; the Cuban Missile Crisis almost brought the Soviets and the Americans to the brink of nuclear war; Soviet propaganda never shied away from mentioning Soviet nuclear capacities. Because of these and other similarities, today’s argument about a new cold war is not without merit. However, there are at least three significant differences between the Cold War period and the current situation. The first major difference is that the Cold War was an ideological struggle between capitalism and communism, between liberal democracy and totalitarian Marxism-Leninism — in other words between two comprehensive idealistic models of political, economic and social development. Contemporary Russia’s economic system, in contrast to that of the Soviet Union, is capitalist, so Russia cannot oppose the west on the grounds of differences of economic models of development. Moreover, contemporary Russia is not guided by any single political ideology. The state-backed political discourse in Russia appears to be a postmodernist mixture of various symbolic references to ultra-conservatism, Stalinism, ultranationalism and even internationalism, but this mixture produces no consistent system of ideas that could function as a state ideology. Ironically, this is understood well by Russian right-wing extremists such as Aleksandr Dugin, who claims that Russia will not be able to win the war with the west without being guided by a clear anti-liberal ideology. The second major difference is that the Cold War was a period of global stand-off between NATO and the Soviet-led Warsaw Pact alliance, which included many central and east European countries, and this stand-off exerted substantial impact on the entire world. Contemporary Russia, however, has ultimately failed to build a sustainable political alliance with other countries. This failure is partially related to the absence of an idealistic and attractive model of political development. Neither the Commonwealth of the Independent States, the union that was formed after the demise of the Soviet Union and united nine of the 15 post-Soviet republics, nor the Russia-dominated Collective Security Treaty Organisation, which consists of six post-Soviet states, has become an alliance that would support Russia in its open conflict with NATO. Moscow’s most recent attempts to garner foreign support produced little results. For example, even Belarus, Russia’s main ally, refused to recognise the annexation of Crimea, while Vietnamese authorities have refused to allow Russia to build a military base just a few days after Moscow had voiced its intentions. The third major difference is that, during the Cold War, Soviet officials were economically isolated. Because of the non-market principles of the Soviet economic system and totalitarian control over the citizens, Soviet elites could not even dream of establishing businesses anywhere, let alone western countries. Russian post-Soviet elites, however, have managed to integrate into the west economically and personally. Robbing the already impoverished Russian population, Russian kleptocrats open businesses, launder money, buy property and send their children to study at the most prestigious schools and universities in the west. A genuine real cold war would threaten their way of life, which clearly prevail over their patriotic feelings, if any really exist. Despite the differences between the Cold War period and the situation today, the Russian authorities are vitally interested in promoting the idea of a new cold war with the west for domestic and foreign policy interests. Domestically, the Kremlin needs to constantly mobilise the population, make Russian citizens “rally around the flag”, in order to retain power at a time when the authorities cannot deliver economic growth to the Russian population. 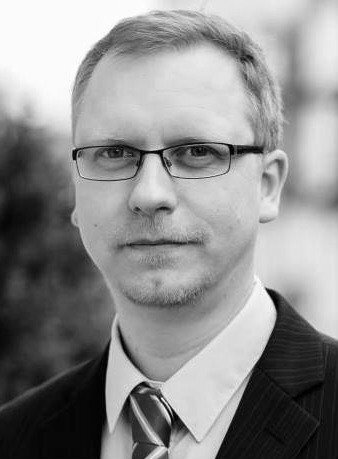 The Kremlin also benefits from pushing the “new Cold War” narrative to western nations by implicitly leading them into a rhetorical trap: (1) if it is a new Cold War, then Russia should have a status of a global power that is entitled to have its sphere of influence (like the Soviet Union had); (2) if it is not a new cold war, then the west should lift sanctions, stop isolating Russia and return to business as usual. Moscow’s Cold-War-style aggressive rhetoric and sabre rattling are understandable manipulative manoeuvres, but there is another factor that undermines the “new cold war” argument. Russia’s economy is so weak that it simply cannot afford a protracted “Cold War” with the west. Russia’s Reserve Fund will deplete in 2017, and then the authorities will have to take money from the National Welfare Fund to compensate for the budget deficit. And looking at the Russian federal budget for the 2017-2019 period, one can say that there is no “hot war” with the west in the budget either: considering the military expenditure, Russia will spend around 4.7% of its GDP on defence in 2016, but it will spend only 3.3% of the GDP in 2017. Even the non-public part of the military expenditure will decrease in 2017 compared to 2016, which was the year of Russia’s active involvement in the war in Syria and continuation of its war against Ukraine. 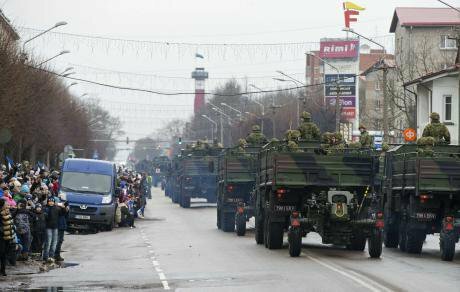 For many, Estonia appears to be a new frontline in Russia's "hybrid war" against the west. (c) Liis Treimann / AP / Press Association Images. All rights reserved.If Russia’s economic situation does not allow it to become engaged in a conventional war with NATO, it does not mean that Putin’s regime will start behaving responsibly on the international arena. The Cold War was a period of clear rules and red lines, and while the US and the Soviet Union, as well as its allies, openly fought several proxy wars during the Cold War in a number of so-called “Third World” countries, the Americans and the Soviets adhered to the rules of the game which helped avoid a new World War. These rules still exist today, but their boundaries are less clear. The actions of Putin’s regime keep eroding them even further by disseminating conspiracy theories through propaganda channels aimed at western nations, supporting anti-EU political parties and movements both on the far right and the left, taking advantage of political and economic disputes between EU members states, attempting to corrupt western politicians and buy political influence, interfering in the US presidential elections and undermining transatlantic relations. By waging a psychological warfare on the west, by eroding the boundaries of the contemporary rules of international relations, Moscow strives to force western nations in general and the US in particular to agree to a new set of rules. Experts call this set of rules a “new Yalta agreement” referring to the Yalta Conference held in 1945 in Crimea where the leaders of the US, UK and Soviet Union divided Europe into two spheres of influence. A new Yalta agreement would legitimise the indefinite rule of the authoritarian kleptocratic regime in Russia and fix a Russian geopolitical sphere of influence at the expense of sovereign nations neighbouring Russia. Were the collective west to conclude such an agreement with Moscow, it would betray pro-democratic aspirations of the nations in Russia’s neighbourhood and deprive of all hope Russian people who are effectively held hostage by Putin’s kleptocratic regime. In the west itself, the conclusion of a new Yalta agreement with the Kremlin would deepen the crisis of liberal democracy and encourage corrupt political and economic practices aggravating social inequality. Moreover, a conclusion of a new Yalta agreement would not provide security for western states. The Cold War was indeed a period of extraordinary peace for the capitalist world, but since a new Cold War is largely an elusive concept to describe the current situation, there will be no peace for the west even if it agrees to Moscow’s rules of the game. The only right strategy to counter Russian psychological warfare is to stand ground, uphold liberal-democratic values, remain united, prevent Russian money laundering through western institutions, resist the temptations of cynical postmodernist realpolitik, and address internal social problems that are being exploited by the Kremlin.